I am spending lots more time in the bedroom at the moment following the creation of my new desk and workspace and it’s helping me to look at it with a fresh eye. With the sun pouring through the windows (on several occasions!) and showing up flaws and imperfections, I’ve been thinking of ways to create a more serene summer room. I don’t want to spend a lot because summer doesn’t last for very long here in the UK and before you know it we’ll be looking at new Autumn ranges, but I would like to bring a little piece of the sunshine into the room for a while. So here are some of my ideas for updating your bedroom for the Summer. I know it’s a cliché and I say it all the time but really spending a few hours decluttering and cleaning up will make the room feel all summery and fresh without spending a penny. Put all clothes, clutter, paperwork, shoes and so on away and clear the space. It will look more spacious for a start and allow you to see what else you could update to give the room a new lease of life. Get rid of winter bed bugs and treat yourself to a new mattress or vacuum and turn it at the very least. Add some fresh flowers and a few new scented candles and you’re part way there. To be honest, this may be as far as I get! Pretty, colourful boxes, clever under the bed storage, or updating your dressing table storage is an easy way to clear the clutter and add a little sunshine into the room. 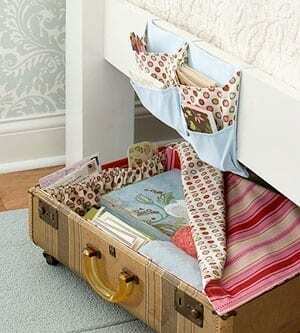 If, like me you have a divan style bed that gives you plenty of storage then you won’t need this idea, but one of my favourite bedroom storage ideas has to be this upcycled suitcase that rolls under the bed. Pretty and functional, what more could you ask for! I love a new set of bedding! In our room, where we have simple walls and a statement wallpaper the bedding needs to work with the scheme so I’m quite restricted on colours and styles. But if you don’t have this restriction, changing the bedding can give the room a whole new feel. Light and bright patterns or colours for the summer, and if you can get away with it, add something floral. Change the throws and pillows for lighter fabrics instead of heavier, wintery textures and instantly you have a fresher feel. If you’ve been out on summer days out with the family and have some lovely photographs why not create a wall a collage which is a great, inexpensive way to fill the wall. Frame some bright and colourful wallpaper samples and hang symmetrically to give it impact. Focus on outdoor images containing the beach, flowers and holidays. Or why not consider creating your own bespoke wall art – I just love this button creation that I found on Pinterest from Etsy. I might have to give this a go! 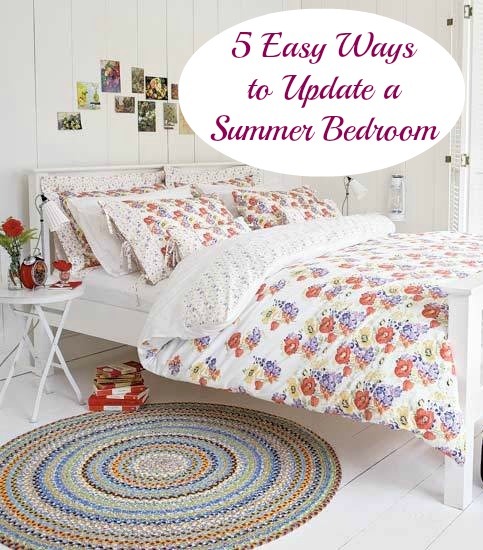 Changing around the pictures on your walls is a very easy way to update your summer bedroom. Admittedly with longer days we don’t need as much functional lighting as in the Winter, but do make sure you have the right kind of lighting. Good reading lamps, either mounted on the wall or positioned next to the bed are great for bedtime reading. I’m really pleased with the new light we acquitted recently from Habitat but still think we need some subtle, low lighting in the room for when we’re wandering around. If you have space for soft wall lights or even a dimmer switch on your main light these can all add to the atmosphere. Pingback: Cómo hacer obras de arte con botones Reciclados?